The Wildcard Tournament is over, we are down to our top four teams remaining. This week was the most closely fought week of the Summer Tournament yet. It took four rounds of games to narrow the ten teams down to a single winner who qualified to join the top three in the finals. Before we recap last week. here’s what to expect from the upcoming Finals Weekend. The finals will take place over the course of this weekend. Best-of-three semifinals will be on Saturday evening with the best-of-five Grand Final to crown the Summer Champion on Sunday. You may be wondering why the top two teams from the championship table are in the same semifinal. This is because rather than seeding teams into the semifinals, the top team going in gets to choose their opponent. The top seed, We are feather feather getting back together, chose to face Huddersfield White. Congratulations to those teams for making it so far! 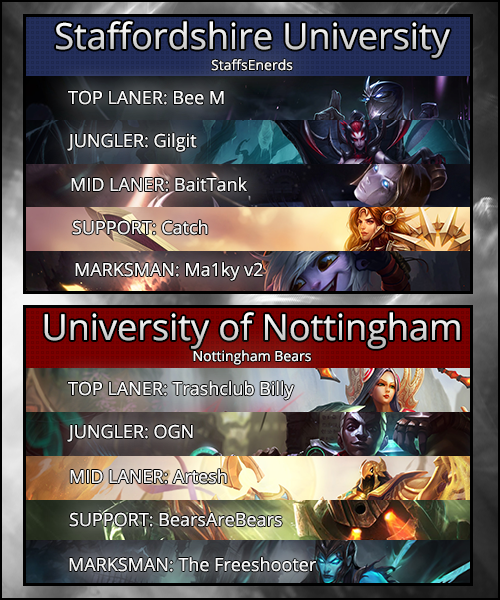 This week the featured match just had to be the final, so here it is: the Nottingham Bears vs the StaffsEnerds. The game started with standard lanes (as normally happens in the NUEL, let’s face it). The first action was at 2 minutes in, BaitTank on Orianna almost killed Artesh on Azir by making use of Orianna’s passive-augmented auto-attacks level 1. Azir lost his Barrier and Flash to escape with Orianna burning her Flash. Immediately at level 2 they clashed again and this time Azir, having no Summoner Spells, gave up First Blood. Over the next few minutes various Flashes were lost on both teams but the gold remained separated only by the First Blood and no one died. It took until 7 minutes for second blood. Orianna had been pushing her advantage and went aggressive on Azir. But this time she very narrowly lost out and gave up the revenge kill to Azir. Mid lane remained just as intense after however. Immediately after they both got back to lane they went at it again with Orianna coming out on top. Gilgit on Elise tried to gank during the fight but didn’t even get an assist. At 9 minutes OGN on Ekko ganked bot lane. But the StaffsEnerds bot lane took down the baiting Nautilus (played by BearsAreBears) before Bee M on Shen used Stand United from the top lane to turn it round for a second kill, the victim this time The Freeshooter’s Kalista. Both kills went to Ma1kY v2’s Tristana getting the marksman off to an amazing start. Staffs immediately picked up the first dragon of the game as a result. The very early game was defined by 1v1s mid lane, this period in the game was defined by ganks there. Immediately after he respawned Nautilus ran to mid lane and, coordinating with Ekko, ganked the Orianna for a kill. Ekko repeated the gank at 12 minutes in (without Nautilus) and picked up another kill. Another kill mid lane happened a minute later, this time Elise ganked and picked up a kill on Azir. The arrival of Mid game was announced with the first true teamfight happening just before 15 minutes at blue side Raptors. Nottingham picked up three unreturned kills in the 4v4 fight (neither Irelia or Tristana were there) and opened up a 1.6k gold lead for themselves. In the aftermath of the fight Tristana arrived and, alongside Orianna, picked up a kill on Azir, meanwhile top turret went down to Trashclub Billy on Irelia. Overall this gave the Bears just under a 2k gold lead. A minute later the Bears duo didn’t realise how much of an advantage the 30 cs and 2 kill up Tristana had over them, letting her get a double kill onto them in the bot lane. This forced some of the other Bears to come down river to shore up the hole in their defenses (not to mention to cover Dragon) which allowed Orianna to take down their mid turret and even out the gold. At 18 minutes the Bears started the Dragon but peeled off for a fight with the entire enemy team. Staffs won the fight with a triple kill on Tristana (who had her Infinity Edge power spike to Kallista’s BF Sword). The Enerds then took the Dragon and killed Ekko when he tried to steal it. The team from Staffordshire University were now sitting with a comfortable 3k gold lead. The game quieted down for a few minutes until, at 22 minutes, the Bears grouped mid lane. Nautilus got a hook onto Tristana but she escaped with Rocket Jump, though Shen’s Stand United was used as well. Staffs disengaged successfully before snatching a re-engage in the form of a Shen taunt and Orianna Shockwave combo for a kill on Azir. Staffs couldn‘t get an objective from this however. A few minutes later Azir died yet again as an Orianna Q-W combo chunked him for half his health allowing for two easy crits from Trisana to finish the kill. This gifted Staffs their third Dragon though Bears traded mid turret for it. However being so far up let Staffs collapse in on the Bears for a fight. Despite Irelia’s best efforts in the fight the team from Nottingham lost four members for only a single kill. Staffs then picked up the blue side tier-2 mid turret and extended their lead to 5k gold. At 26 minutes Orianna and Leona caught out Azir in mid lane for another kill (not that he was worth much at this point) while Shen picked up top lane outer turret. Things were looking dire for the Bears: they were bleeding turrets, kills and gold. With top-lane outer turret down the StaffsEnerds set up to take down the next turret in the lane while controlling top-side jungle with vision. As a result they got a catch on both Azir and Kalista and with both opposing carries down they headed back for Baron. When the surviving Bears attempted to contest it (somewhat foolishly) they only gave up two more kills alongside the Baron. Staffs then charged straight to the red side base and took down the mid lane tier-3 turret. However a foolish use of Tristana’s Rocket Jump allowed the Bears to engage with it on cooldown. They managed to gift the Yordle her first death of the game (she had a 13-1-7 score overall) and force Staffs back in a two-for-two fight, saving their inhibitor for now. Not for long though, 31 minutes into the game Staffs bullied the Bears away to take the now open mid-lane Inhibitor. They then rotated to bot-lane tier-2 turret and this time the Bears refused to be bullied away from it. They engaged for a last ditch attempt at turning it around but, as you would predict from the 12k gold lead, the blue team picked up four unreturned kills. As the Enerds charged to the red team Nexus the Nottingham Bears surrendered. The StaffsEnerds were the winners of the Wildcard Tournament and earned qualification to the Summer Tournament Finals. The casters were split with between giving MVP to either Ma1kY v2 on Tristana or BaitTank on Orianna. This leaves the final decision to me. I’m going to award this week’s MVP to Ma1kY v2 on Tristana. Though BaitTank’s Shockwaves were on point and he picked up first blood solo he gave up a few too many kills in the crucial early game, meanwhile Ma1kY was doing little except getting fed and demolishing towers.